A couple days ago I posted about how the satellite imagery in AWS was much worse than Google Maps. Andrea Rosso commented that AWS did have much better imagery than Google (though it costs more in credits). I decided to take a look myself using the credits we get from our ESRI Developer Network license to see how my little part of Tempe, AZ looks (I mentioned yesterday that Virtual Earth has really old imagery that doesn’t even show our building). Take a look at the GlobeXplorer Premium US example for my building at work (the grey roofed building in the middle of the image). That is a great looking image right there. 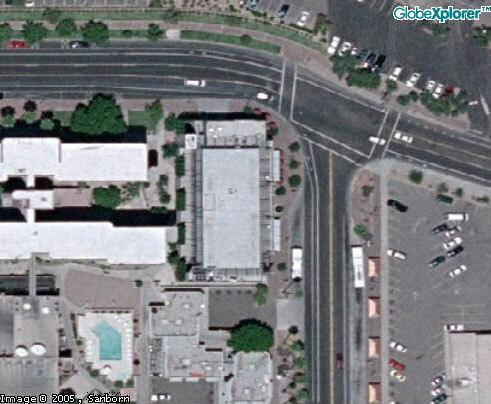 Compare it with the closest Google Map/Earth image below. You can make out my building (yea, I didn’t center it too well), but compared to the detail of the ArcWeb Services it falls short. 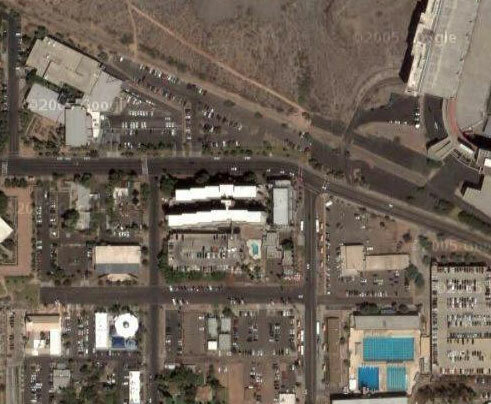 If high quality satellite imagery is needed, there is no comparison between AWS and Google Maps. Of course this isn’t available for Public AWS, but it does show how you can get more value out of ArcWeb Services if you do choose to do so. Andrea did say that he though a “coverage map” would be a great idea for a service such as this so you can see if this very high quality imagery is available for your area so maybe we’ll see something for AWS 2005.